In a large pot, melt the butter over medium-low heat. Add the marshmallows and cook, stirring constantly, until melted. Once melted, add the Reese's Puffs Cereal. Remove from heat, stir until cereal is well combined with the marshmallows. Press cereal mixture into a glass pan, sprayed with nonstick cooking spray. In a stand mixer, combine peanut butter, powdered sugar, and milk. Spread mixture over cereal bars. In a microwave-safe dish, zap the strawberry jam for 20-30 seconds, or until soft and warm. Place dollops of the jam on top of the peanut butter frosting. Allow to sit for a minute, then use a knife to swirl the jam on top of the peanut butter frosting. Allow to set slightly before slicing and serving!! Peanut butter and jelly! Take this classic flavor combo, and turn it into crispy no-bake cereal bars topped with creamy frosting, and a swirl of strawberry jam. 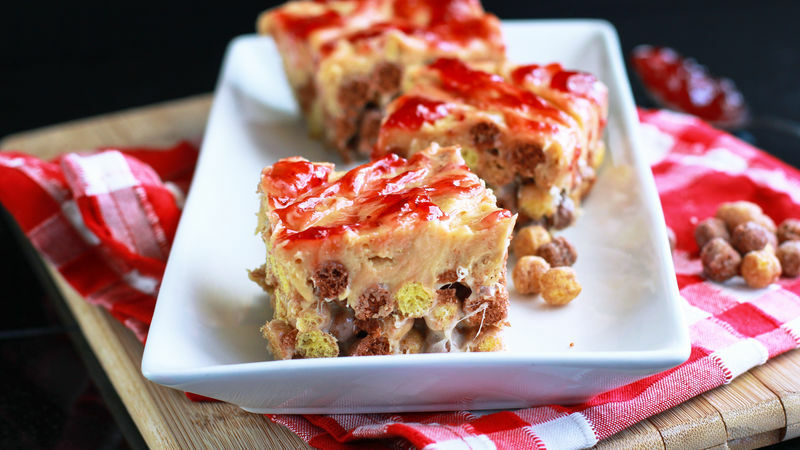 Who needs a peanut butter and jelly sandwich for lunch when you can have these Reese's PB&J Cereal Treats for dessert? Absurdly quick and simple to make, bursting with all the mouthwatering goodness of your favorite flavors…isn't it time you ate dessert first? Here's your lineup, peanut butter lovers! Reese's Puffs cereal, butter, marshmallows, all the stuff for peanut butter frosting, and strawberry jelly for the belly. Start this recipe off the way you would any cereal-crispy bar recipe. Melt butter, toss in marshmallows, Reese’s Puffs gets mixed in. Then spread the cereal into a lightly greased baking dish. Hello, happiness. Except it gets better. Because now you're going to prep creamy, dreamy peanut butter frosting to go on top of those crispy, crunchy cereal bars. It's getting hot in here. Zap your favorite strawberry jelly in the microwave, then plop little jelly dollops all over the top of the frosting. Let the warm jelly sit for a moment -- it'll melt the frosting just a bit and make it easy to swirl the topping all gorgeous-like. Swirl the jelly with a knife. To get a really purty swirl, use the tip of your knife to spread the jelly left to right, then top to bottom. Now the hard part….waiting for the frosting to set up. Tick tock, tick tock…give your dessert bars a minute to firm up. Feel free to stick your treats in the refrigerator to help them set up more quickly. Because, ya know, the sooner, the better. Of course, sometimes sharing is sooo overrated. Enjoy!